Mayor John Tory and Toronto Police Services Board Chair Alok Mukherjee at the meeting on Thursday. At its first meeting since the mayor vowed to end carding, the Toronto Police Services Board voted unanimously to re-implement its April 2014 carding policy on Thursday, taking the first steps to reform the controversial police practice. The motion, passed after increased community outcry over carding over the past two months, acts as an interim measure until the Province acts on its plans to place further regulations on street encounters between civilians and police. As a result, the board chose not to approve Mayor John Tory’s motions to permanently cancel carding, something he promised to try and do nearly two weeks ago. “This motion was meant to give some life to the idea that we have to go away from the process of incremental mediated changes, I described it, and that we had to embark on a policy that said this practice of carding was over,” said Tory. He went on to say why he supported an amendment to his motion. Councillor Shelley Carroll (Ward 33, Don Valley East) told reporters after the meeting why she felt that going back to the older policy was better than what they had in place or going forward with Tory’s original idea. 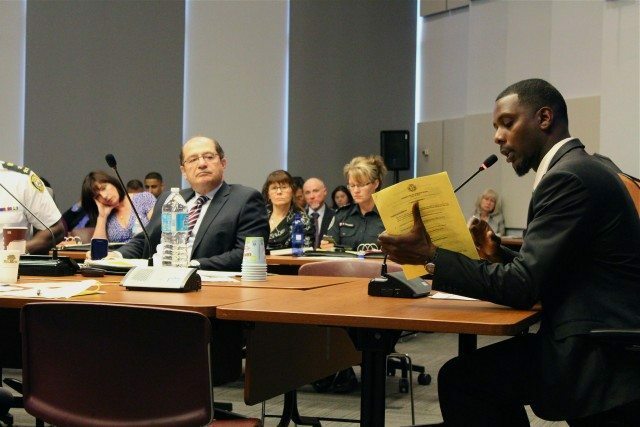 “To simply suspend carding and not leave any kind of accountability or paper trail meant that there really was no guidance to officers in their interaction and Summer is coming, there’ll be plenty of interaction,” said the North York councillor. The 2014 policy is based on the PACER report that came out in 2013. Recommendations from the report include requiring police officers to notify members of the public that they have the right to walk away at any point when being carded, and to issue a physical receipt of the encounter when they do so. However, informing the person being stopped of their rights is not mandatory and is left to the discretion of the officer involved. How the policy will be implemented is now left up to Chief Mark Saunders and the rest of the force. He says that there already was a huge improvement since the PACER report. “To look for a magic word or a magic policy that’s going to make everything better that’s not going to be the case, it simply won’t be,” said Saunders after the meeting. Mark Saunders speaks to reporters after the motion to bring back the 2014 policy was moved. 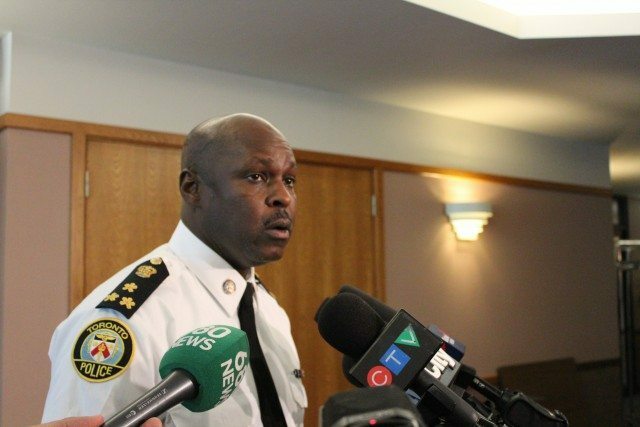 The recently installed police chief went on to claim that he never said that he supports carding but that if things are done properly, the practice enhances community safety. While the 2014 policy is seen as an improvement on the policy that was currently in place, Anthony Morgan, a policy and research lawyer with the African Canadian Legal Clinic, argued that it still falls short. Another part of the policy that Morgan found troubling was the term “at-risk,” which is the criteria given for how an officer may decide whether or not to engage in an interaction and pose questions to someone they stop on the street. He also said that he is concerned with the receipts, which he does see is a positive change, but because those receipts are not a carbon copy, the person issued one wouldn’t know exactly was written about them. Before the motion was moved, much of the meeting was spent listening to members of the community, many of whom gave heartfelt deputations. One that seemed to leave a lasting impression on the board—Tory went on to quote him— was Knia Singh’s account of what it feels like to be targeted by police. Knia Singh giving his deputation to the board. Knia Singh is a law student at Osgoode Hall who filed a Charter challenge against the practice of carding, stating that it violates our fundamental rights. Also at the meeting, TPS Board Chair Alok Mukherjee announced that he will be stepping down from his position as of August 1. In one of his closing statements for that portion of the meeting, he explained why carding was an issue that was close to him, through comments he said he made to Chief Saunders a week ago.